European regulatory manager. After a few years away from the crop protection industry, she joined Adama’s regulatory team in 2015. In her new role Alison will be responsible for working with Adama’s regulatory, technical and marketing teams to develop and implement tactical product campaigns for the company’s range of herbicides and for communicating key trials results and technical product data to stakeholders. has stepped down from the role after 40 years working in the farm equipment industry. Adrian Winnett is no stranger to the Argo Tractors product line, having worked as Landini sales manager for seven years before joining the UK arm of implement manufacturer Amazone, where he was appointed general manager in 2009 and then managing director in 2014.
at Certis will be to promote quality crop protection solutions from tuber to tuber and to build on relationships with key industry partners. “I’m really looking forward to taking a more hands-on role in the UK potato industry and getting out on farm with colleagues, industry advisers and channel partners,” he says. Nick will be based at the Cambridge office and brings technical knowledge to the role with both BASIS and FACTS qualifications. AGRICULTURAL MACHINERY SERVICE TECHNICIAN / ENGINEER This is a varied position in our service department where there is the opportunity to work on our full range of premium brand products, including Fendt, Massey Ferguson, Valtra, Challenger and CAT. The successful applicant will either have technical experience with agricultural machinery, or have appropriate transferrable skills. They must also be highly motivated, and be able to become a strong member of the team, servicing and repairing agricultural equipment both on farm, and in our modern fully equipped workshop. In return we offer an attractive package, with fully fitted company van and ongoing franchise training. The role is varied and offers a competitive salary. Manufacturer training will be provided and other benefits include workplace pension, group life cover and staff discount in country stores. We are offering the opportunity for a Trainee or Apprentice to train and work alongside one of our highly skilled Mobile technicians working on tracked tractors and other related equipment. This is an excellent opportunity for a keen, hardworking and dedicated person to train up to become a fully skilled and qualified technician with a Five Star AGCO main dealer. Please see www.ernestdoe.com/jobs for further information. 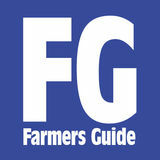 Applicants need to have either a good knowledge of the farming industry, or some existing relevant mechanical training. They must also have a full driving licence and be able to work the hours needed to provide first class customer service. To apply, please email your CV and covering letter to: johnmiller@ernestdoe.com, Service Manager. Closing date for applications: 31st October 2018. 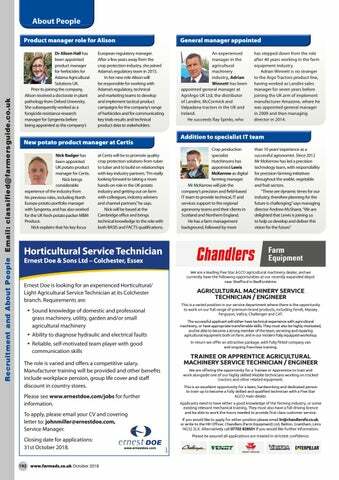 If you would like to apply for either position please email hr@chandlersfe.co.uk, or write to the HR Officer, Chandlers (Farm Equipment) Ltd, Belton, Grantham, Lincs NG32 2LX. Alternatively call 07702 828501 if you would like further information.